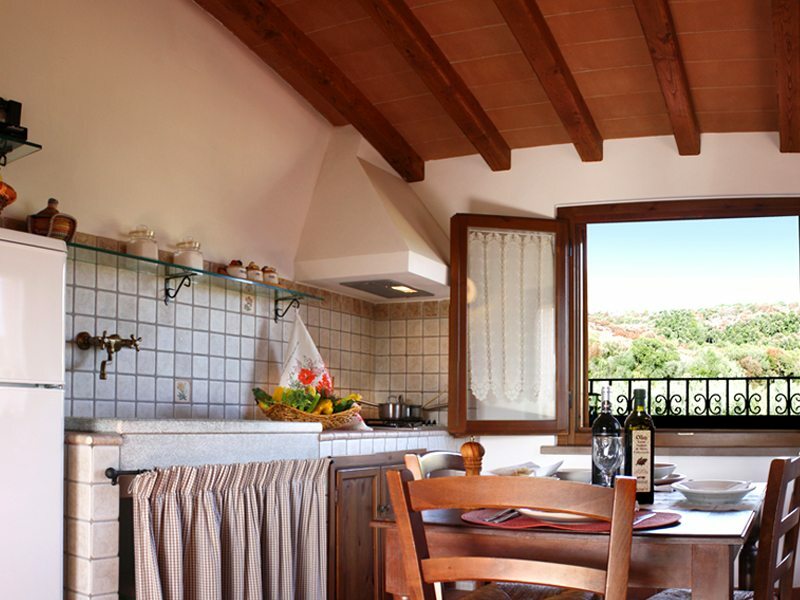 The complex is divided into four units with nice apartments inspired by the traditions of rural Tuscany. 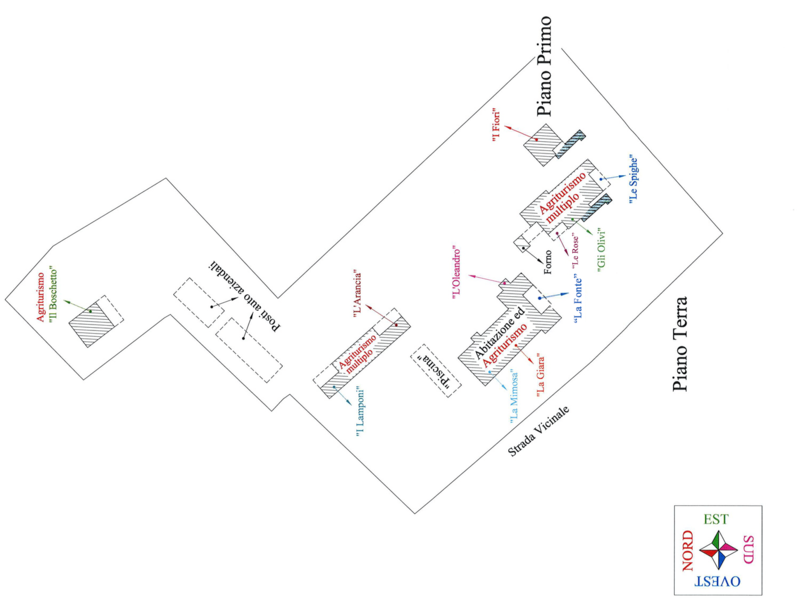 The first group is the family house, “Il Maestrale”, where, on the first floor, the owners live, while, on the ground floor, there are three apartments ,“La Mimosa” “La Giara” “La Fonte” and the double bedroom “L’Oleandro” The second housing complex, “Il Nuovo Casale”, is composed by, on the ground floor, the apartments “Le Rose”, “Gli Olivi” and “Le Spighe”, while, on the first floor, there is the apartment “I fiori.” The four apartments are built according to the principles of energy conservation. 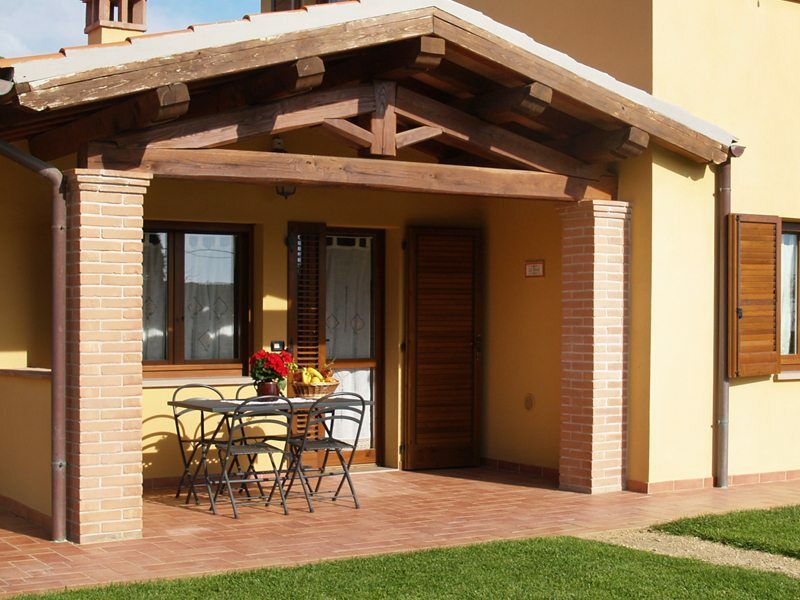 The third unit is “il Boschetto”, detached house, located near the olive grove and next to the children’s playground. 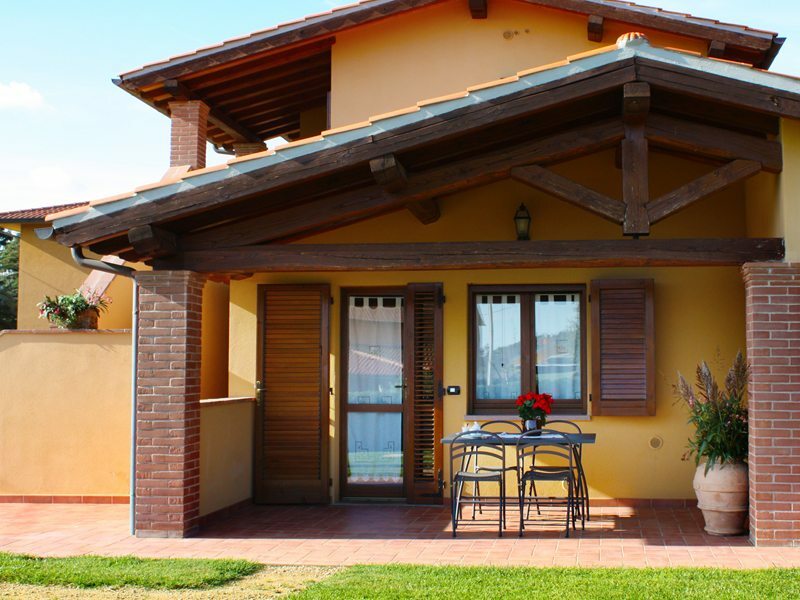 To complete the farm, we have “I Lamponi” and “L’Arancia“, which are two apartments located in the building between the swimming pool and covered parking. Around these, to ensure more privacy, we have created an area enclosed by fencing and hedges. 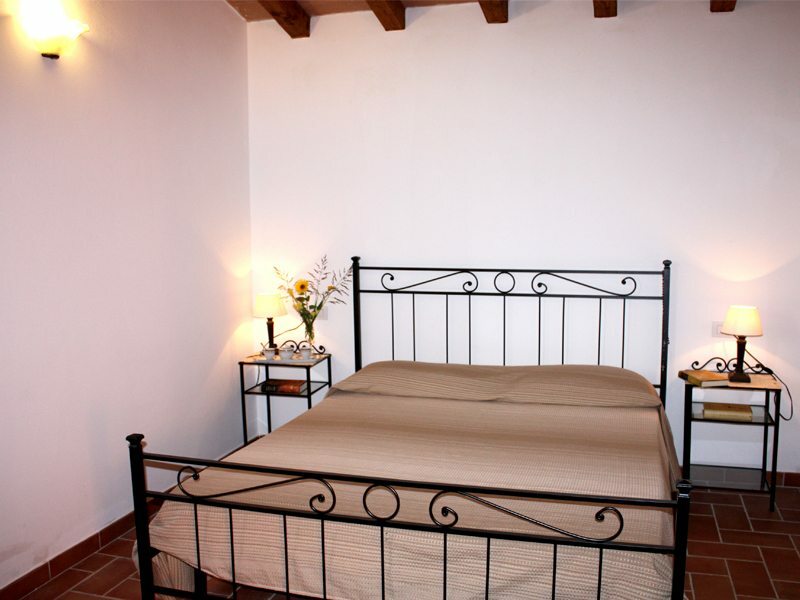 Surrounded by greenery and oleander flowers, this lovely 14 square metre double bedroom is located on the ground floor, on the east side of the family farmhouse. You can access it directly from the garden, thorough an equipped porch. 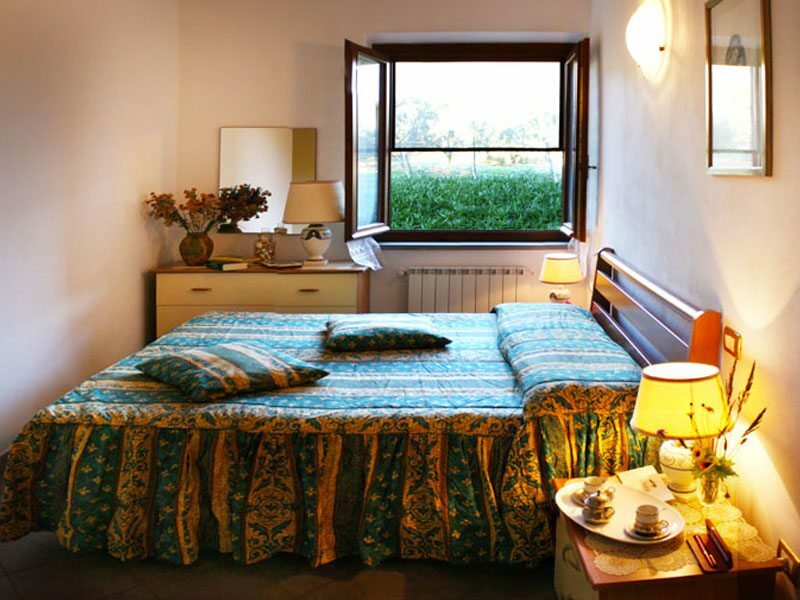 The bedroom, always in the shade, has two windows and a bathroom with shower (3.5 square metres), also with window, and it enjoys very good internal ventilation that makes it a cool and luminous room. Its characteristic, beautiful and functional furniture makes it an affordable and pleasant solution for young couples who wish to have a relaxing holiday surrounded by nature. Internal equipments: cutlery, linen, heating, TV, small plate warmer, fridge, ceiling fan in the room, wifi, mosquito nets. 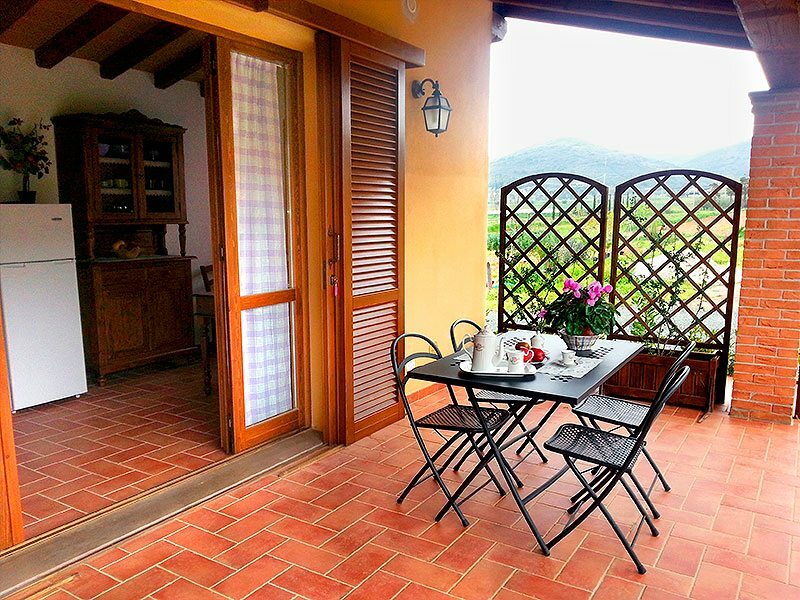 Located on the ground floor, on the west side of the family farmhouse, this 45 square metre apartment has direct access to the garden and it allows relaxing moments surrounded by the sounds and colours of nature. 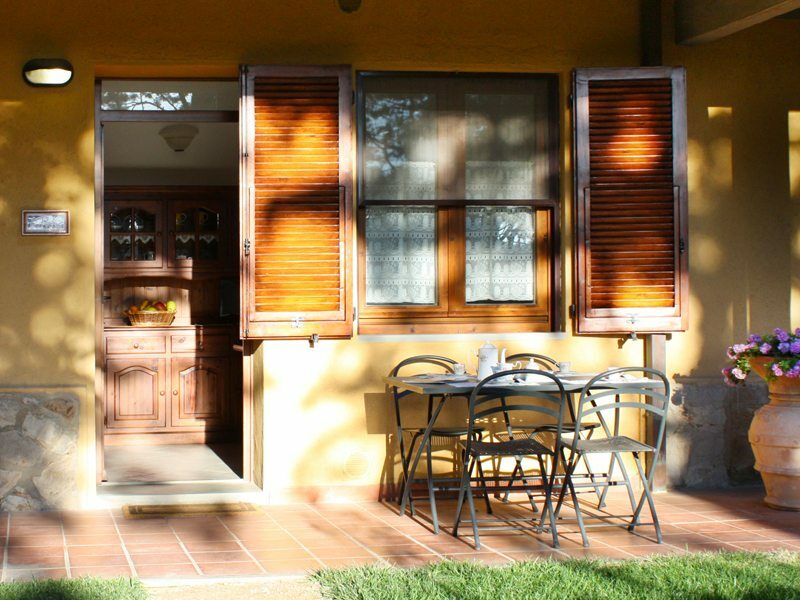 La Giara features an outside covered and equipped space and it welcomes the guests in a pleasantly furnished dining room with period furniture and a kitchenette in marble, tiles and chestnut wood. 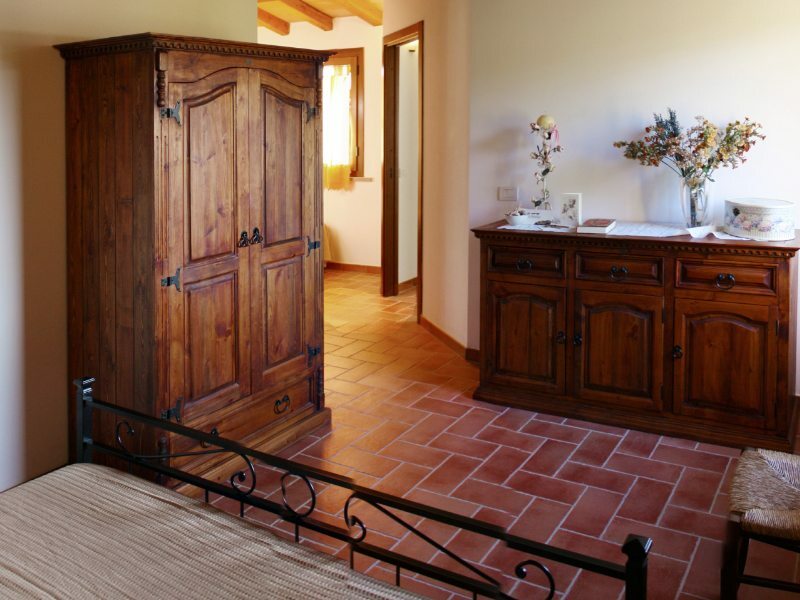 From there, through an access room, you can access the two finely furnished bedrooms. Between them there is a bathroom with shower.Internal equipments: cutlery, linen, heating, TV, gas hob, dish rack, fan-assisted electric oven, 2 door fridge, ceiling fan in the room, wifi, mosquito nets. 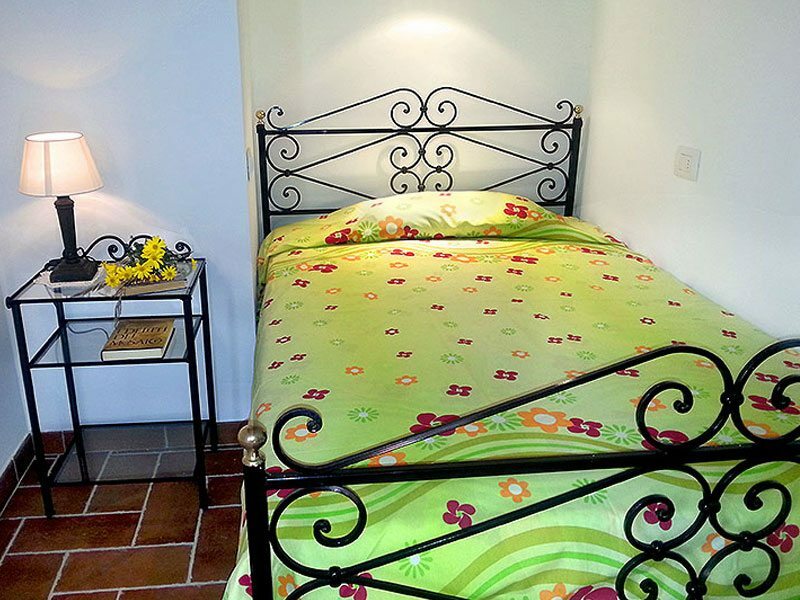 Located on the ground floor, on the west side of the family farmhouse, with direct access to the garden, La Mimosa is a lovely of 35 square metre apartment. You can have lunch in the outside porch surrounded by the garden and plants. The porch leads to the luminous dining room furnished with period furniture and a handy kitchenette in marble, tiles and chestnut wood. From there, through an access room, you can access a cool, spacious and lovely bedroom (double bed and single sofa-bed) overlooking the lawn. The bathroom with shower is spacious and also has a window. Internal equipments: cutlery, linen, heating, TV, gas hob, dish rack, fan-assisted electric oven, 2 door fridge, ceiling fan in the room, wifi, mosquito nets. 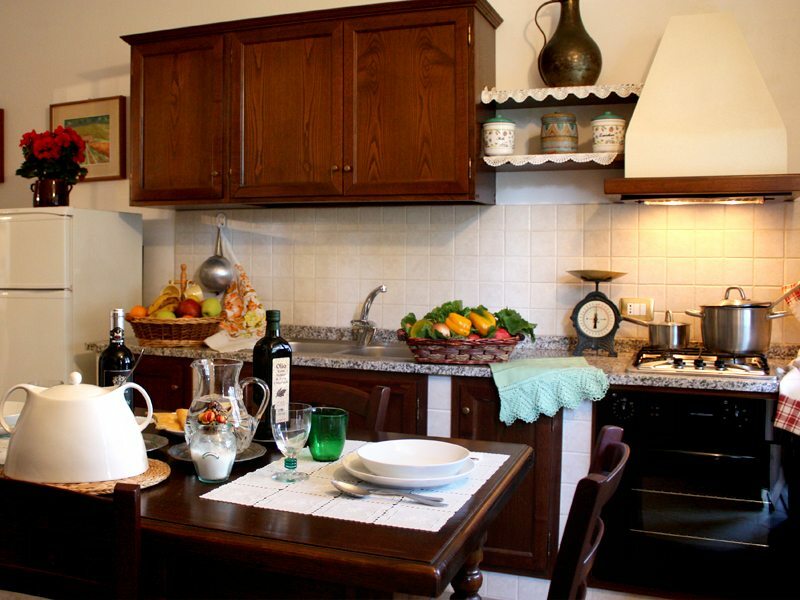 This is a welcoming 32 square metre apartment, located on the ground floor in Nuovo Casale, and furnished with period furniture and timber ceilings with “pianelle” (hand-made bricks) Every detail, from lights to curtains and furniture, has been carefully chosen in order to recreate a particular atmosphere from the past. 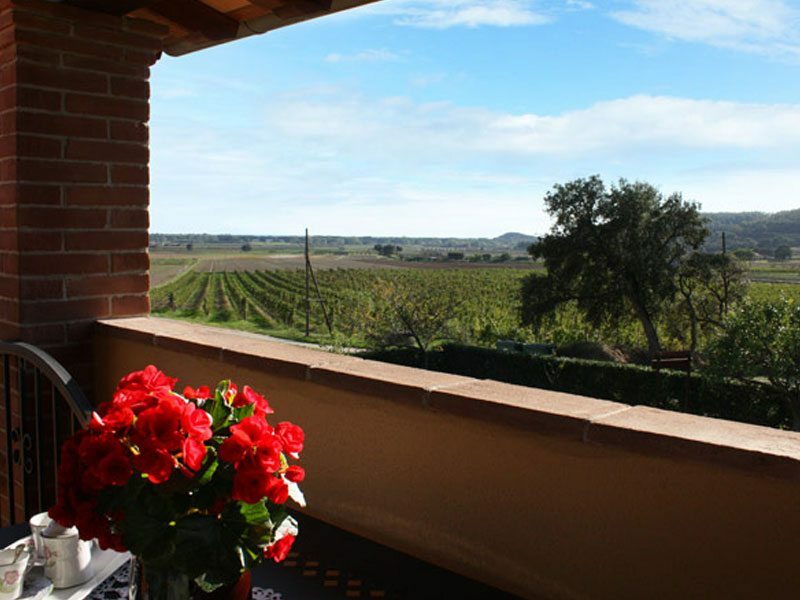 The porch, with its iron furniture, allows you to have lunch surrounded by the silence of the countryside. In the luminous dining room there are traditional Tuscan table and chairs, positioned in front of the brick kitchenette, with hand-made ceramic tiles decorated in pinkish tones and equipped with a period grit sink. A double period cupboard and a comfortable double sofa- bed complete the furniture. 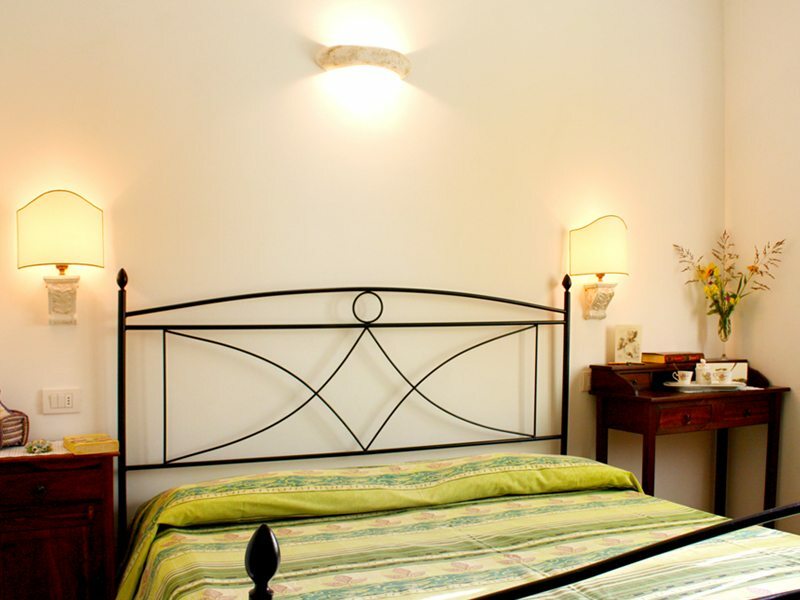 The bedroom is nicely furnished with an iron bed, bedside tables, writing desk and a period wardrobe. The access room leads to the bathroom, furnished in pink tones, with shower and window.Internal equipments: cutlery, linen, heating, air conditioning, satellite TV, gas hob, 2 door fridge, wifi, mosquito nets. 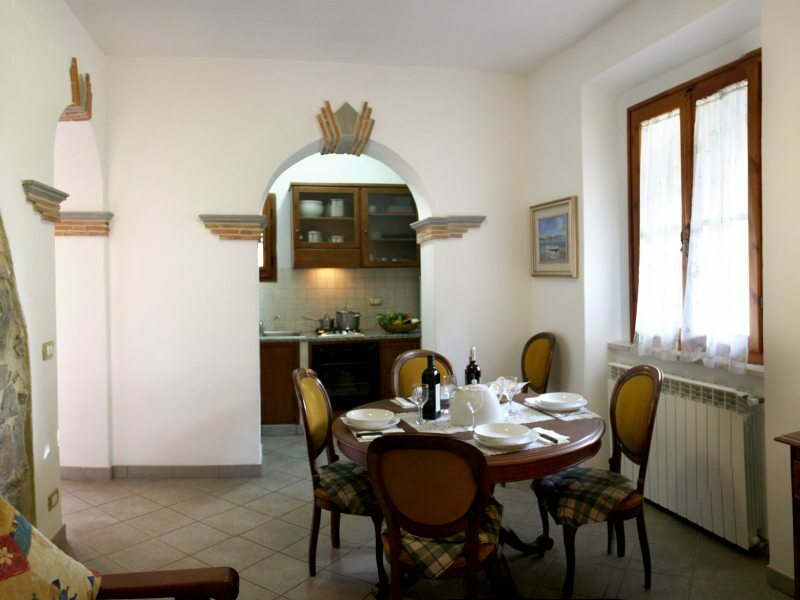 Gli Olivi is a lovely 30 square metre apartment, on the ground floor in Nuovo Casale, and it is furnished in green tones. 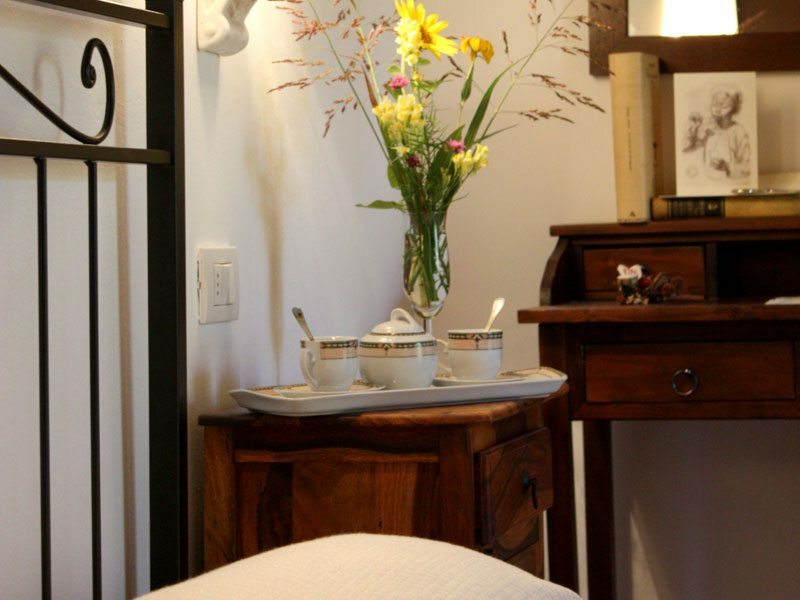 Period furniture, lamps, curtains and every little detail have been chosen carefully in order to convey the feeling of an old rural atmosphere. The apartment has two lovely porches: the first one, with direct access to the garden, allows you to access the apartment; the other one, with iron furniture, is located at the back of the dining room, is always in the shade and is completely independent, so you can have lunch surrounded by hills and olive trees.The luminous living room/kitchen has a brick kitchenette with hand-made ceramic tiles in green tones and olive decorations, a period grit sink, Tuscan-style table and chairs and a single cupboard. The access room leads to the bedroom and bathroom with shower and window. 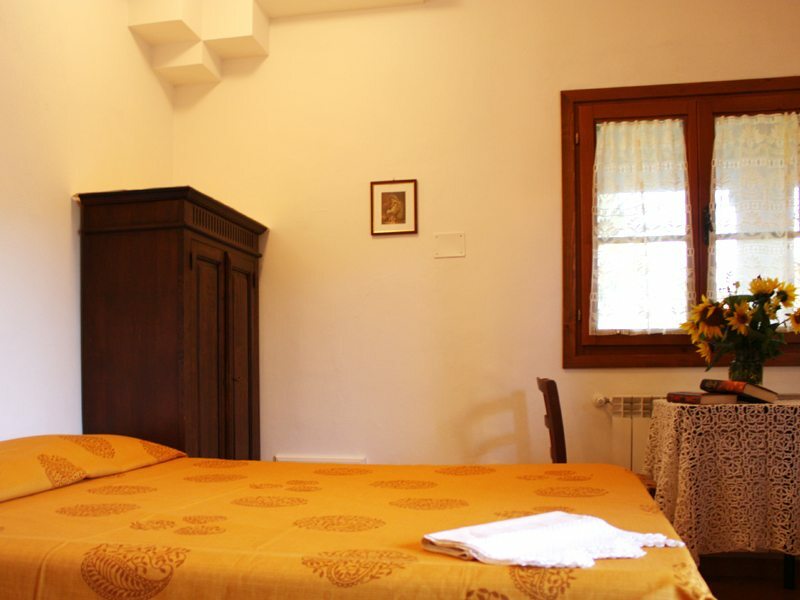 The bedroom is nicely furnished with an iron bed, bedside table, writing desk and period wardrobe. Internal equipments: cutlery, linen, heating, air conditioning, satellite TV, gas hob, 2 door fridge, wifi, mosquito nets. 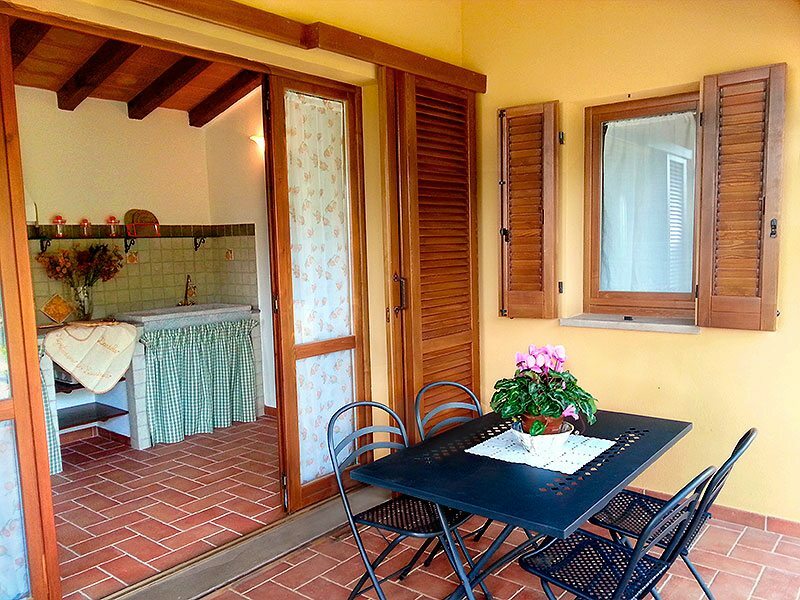 Located on the ground floor in Nuovo Casale, Le Spighe is a 35 square metre apartment with an independent garden and a big porch with iron furniture that allow you to relax and have lunch enjoying privacy and silence surrounded by nature. 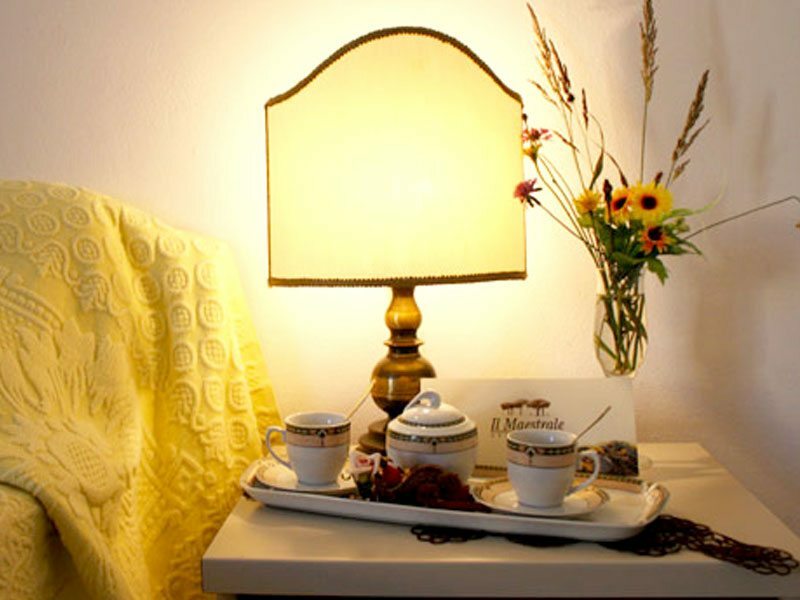 It is a welcoming apartment furnished with period furniture, timber ceilings with “pianelle” (hand-made bricks). Every single detail matches each other and brings back to mind a rural past. 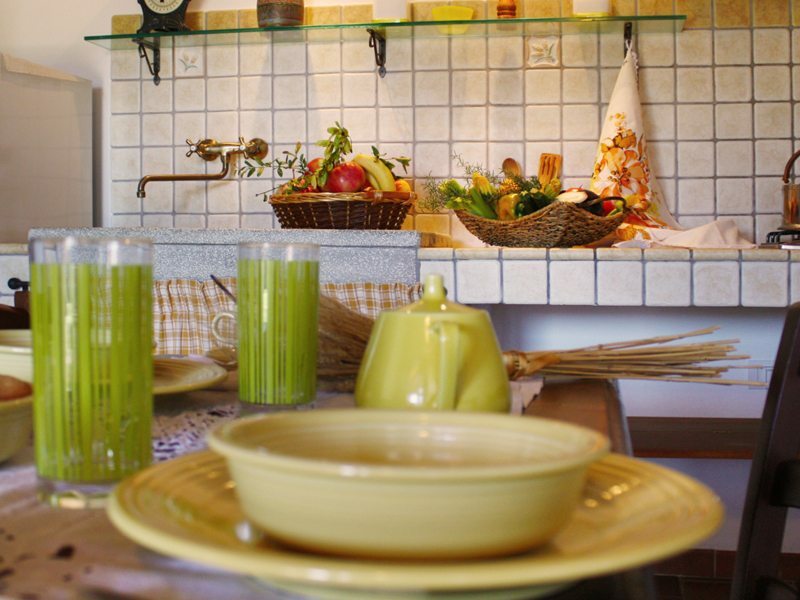 In the luminous dining room there are a table, chairs and a double period cupboard, positioned in front of the brick kitchenette, with hand-made ceramic tiles decorated in blonde wheat tones and equipped with a period grit sink. 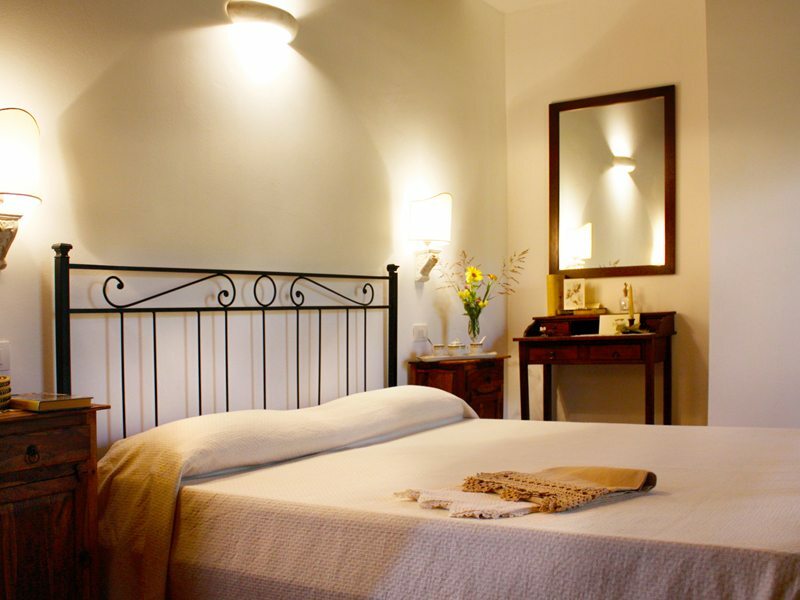 The bedroom is nicely furnished with an iron bed, bedside tables, writing desk and a period wardrobe. The access room leads to the bathroom with window. The bathroom is suitable for disabled guests (there is no bidet) and it has a flat shower floor with chair. Internal equipments: cutlery, linen, heating, air conditioning, satellite TV, gas hob, 2 door fridge, wifi, mosquito nets. 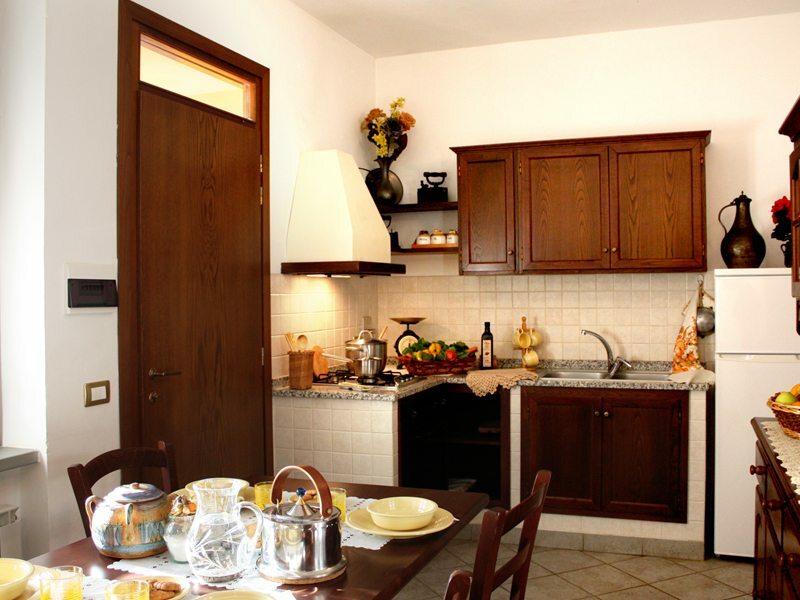 Located on the first floor in Nuovo Casale, I Fiori is a welcoming 31 metre square apartment, furnished in brown tones, period furniture and timber ceilings with “pianelle” (hand-made bricks). 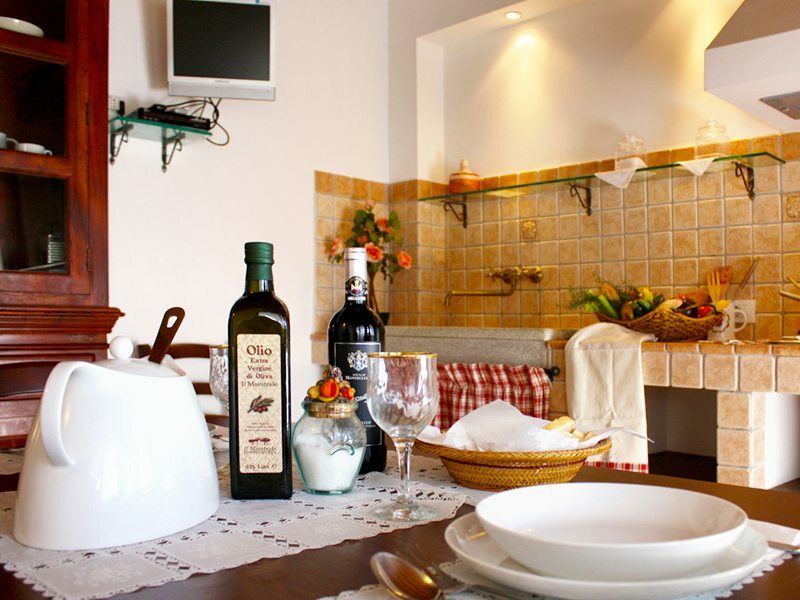 Every single detail has been chosen carefully in order to recreate an old and pleasant atmosphere. 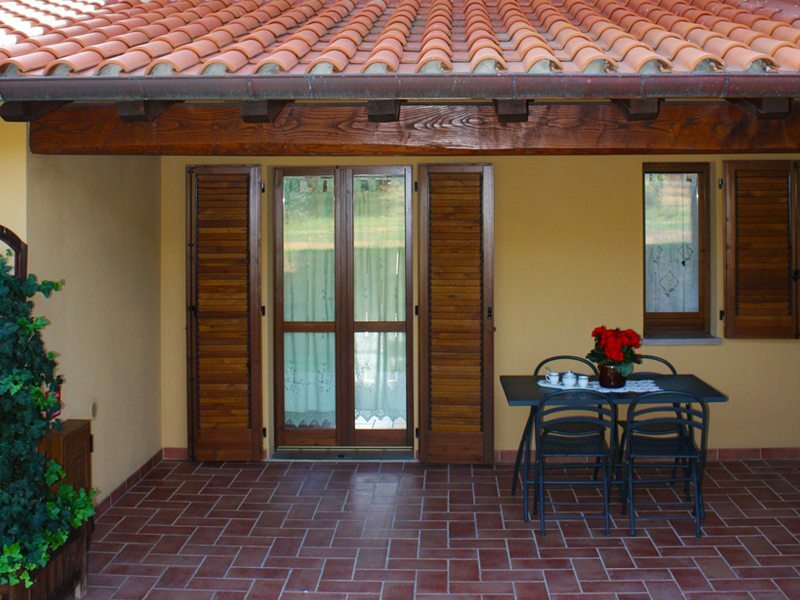 From the garden, traditional Tuscan stairs lead to a lovely covered and panoramic loggia with iron furniture. Here, you can sit, enjoy the cool Mistral breeze and have lunch while enjoying the relaxing view of the countryside.The luminous dining room, with its two big windows and French door facing the loggia, allows a wonderful view of the surrounding landscape: from the green maquis-covered hills to the sea. 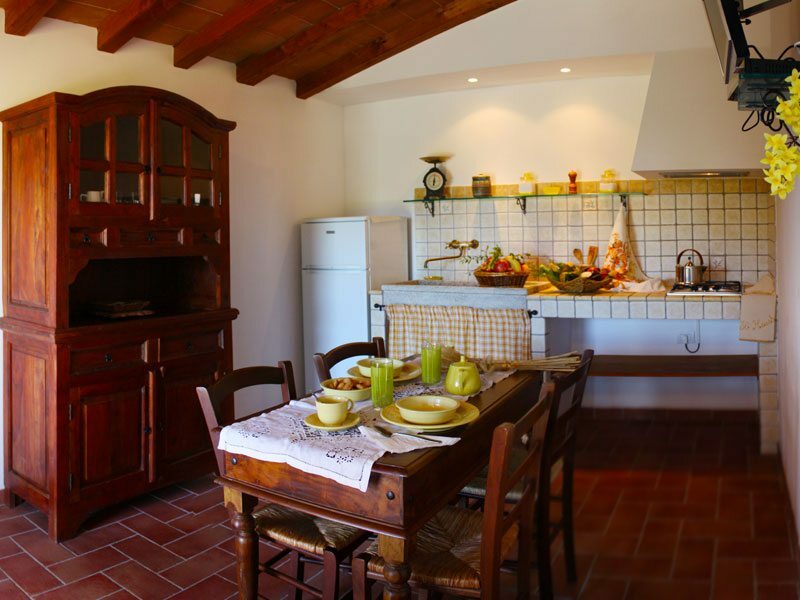 The room includes a brick kitchenette, with hand-made ceramic tiles decorated with flowers and in brown tones, a period grit sink , Tuscan-style table and chairs and double period cupboard . 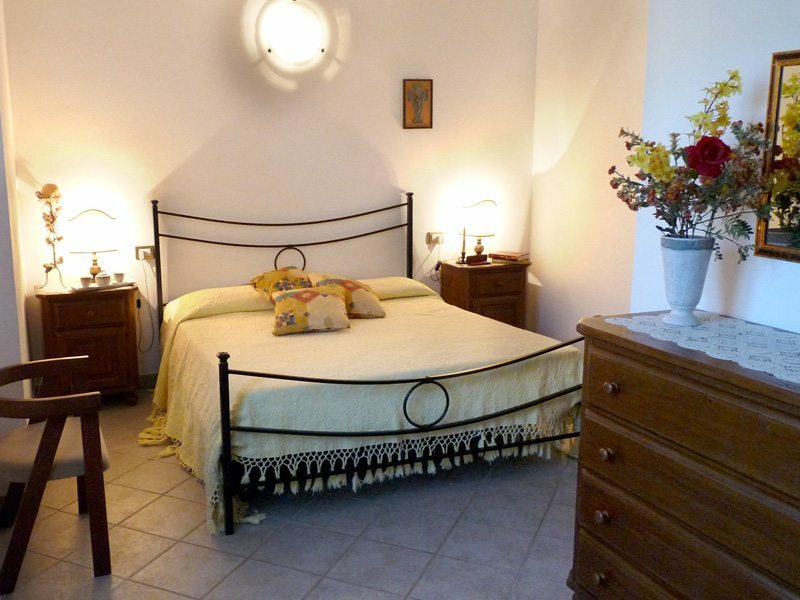 The bedroom is nicely furnished with an iron bed, bedside table, writing desk and period wardrobe. The access room leads to the bathroom with shower and a big window.Internal equipments: cutlery, linen, heating, air conditioning, satellite TV, gas hob, 2 door fridge, wifi, mosquito nets. 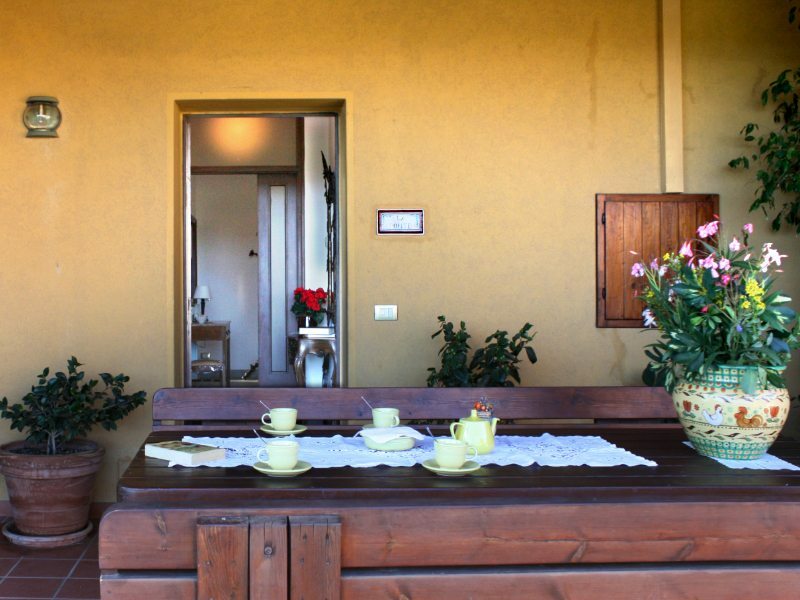 Surrounded by the silence and the olive grove, this detached 45 square metre villa has a big veranda with iron furniture and view on the plain below as far as the sea. Its furniture matches the colours of the wood and the timber ceilings with “pianelle” (hand-made bricks) create a warm, peaceful and simple atmosphere like that back in the old days. The spacious dining room with its big windows has a lovely brick kitchenette, with hand-made ceramic tiles in brown and green tones,period grit sink, Tuscan-style table and chairs and big county-style cupboard.The furniture is completed by a comfortable three-place sofa. The triple bedroom is nicely furnished with a double bed and iron bedside tables, base cabinet and a 2 door country-style wardrobe. 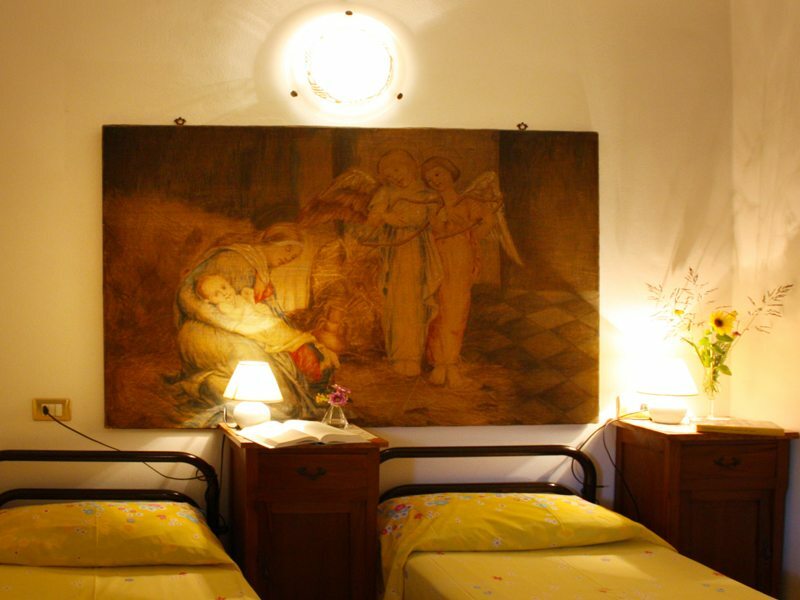 The room includes an area with a single bed and period bedside table. The access room leads to a spacious and luminous bathroom with shower and a big window. 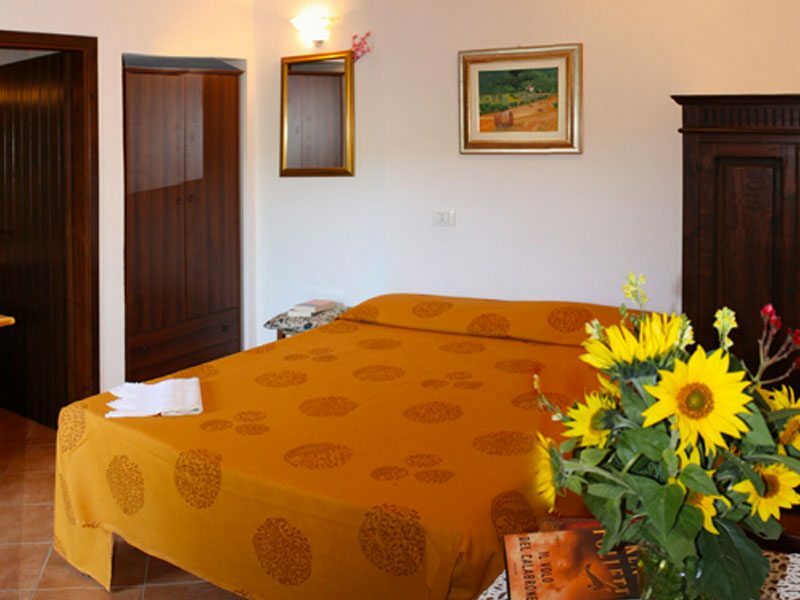 The apartment is carefully furnished with taste in order to guarantee a peaceful and comfortable atmosphere, while its location makes the stay discrete and reserved leading the guests into a pleasant rural atmosphere. Internal equipments: cutlery, linen, satellite TV, electric hob, 2 door fridge, wifi, mosquito nets and conditioned air. 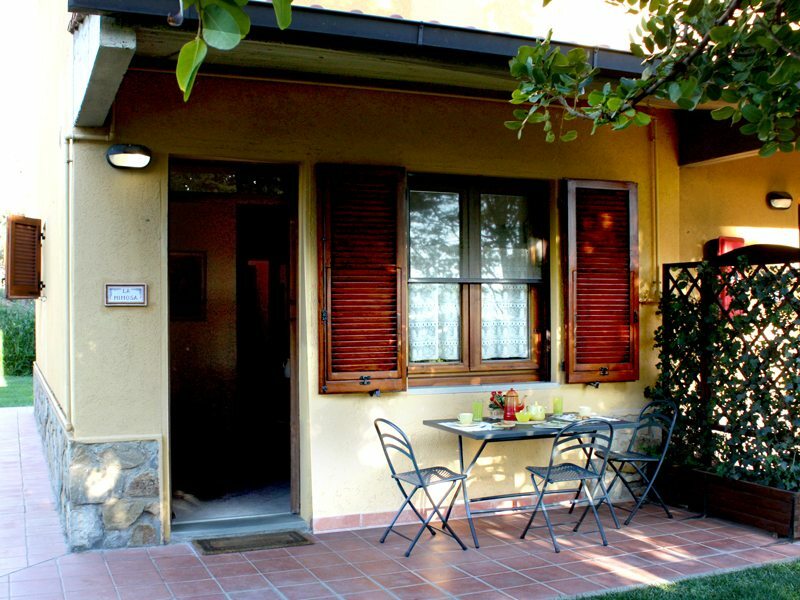 I Lamponi, is a comfortable apartment of 35 square meters, located on the ground floor, on the west side of the house that is located between the pool and parking. 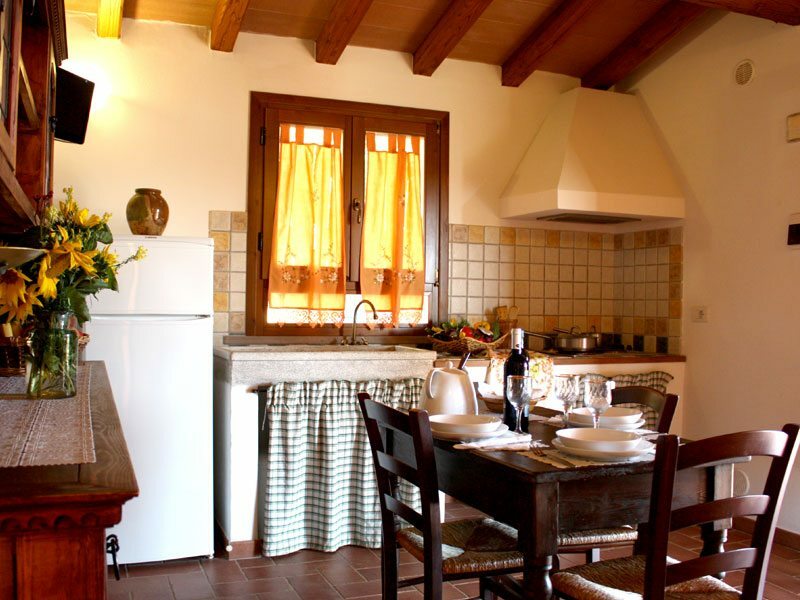 Furnished with antique furniture, wooden ceilings and bricks handmade, it has a kitchen, hallway, bathroom and bedroom. 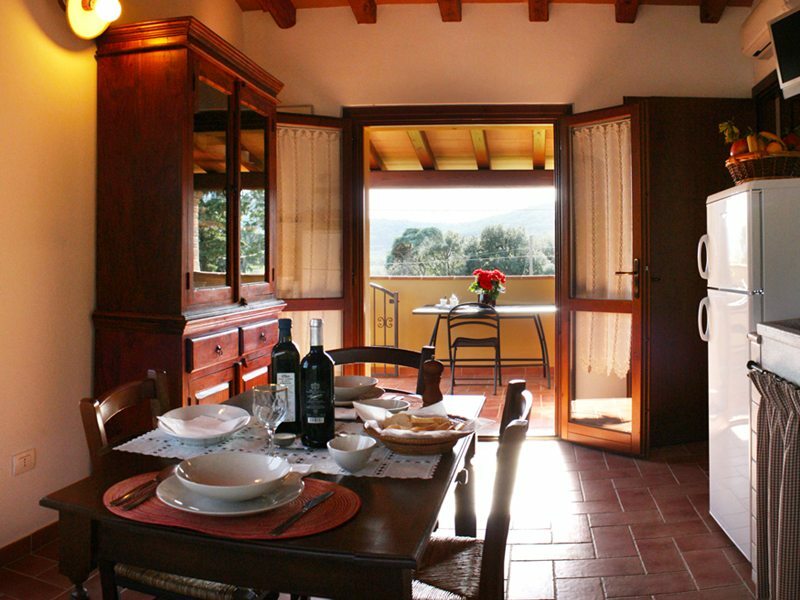 In the porch, that is always in the shade and with iron furniture, you can eat in the green observing our beautiful olive-trees.The kitchen has light from a window and from the large glass door access. 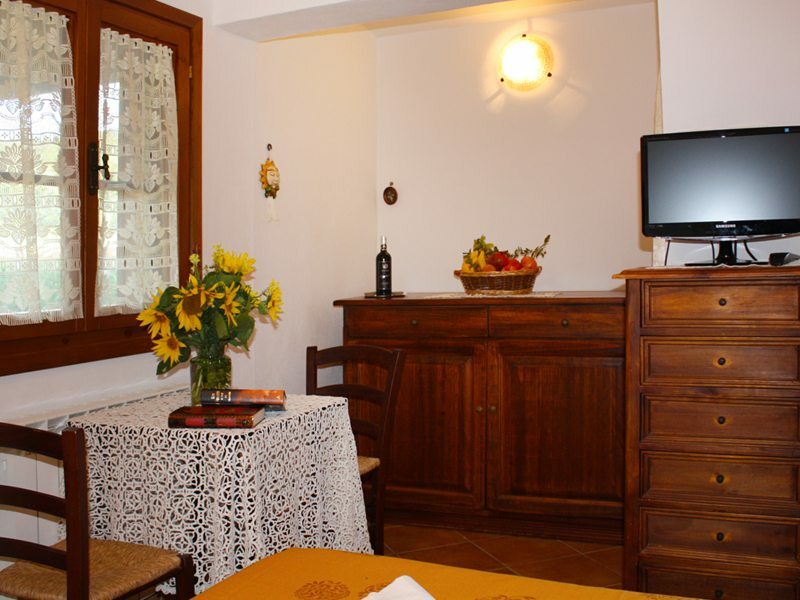 It is furnished with a table, chairs and a nice dresser double body. 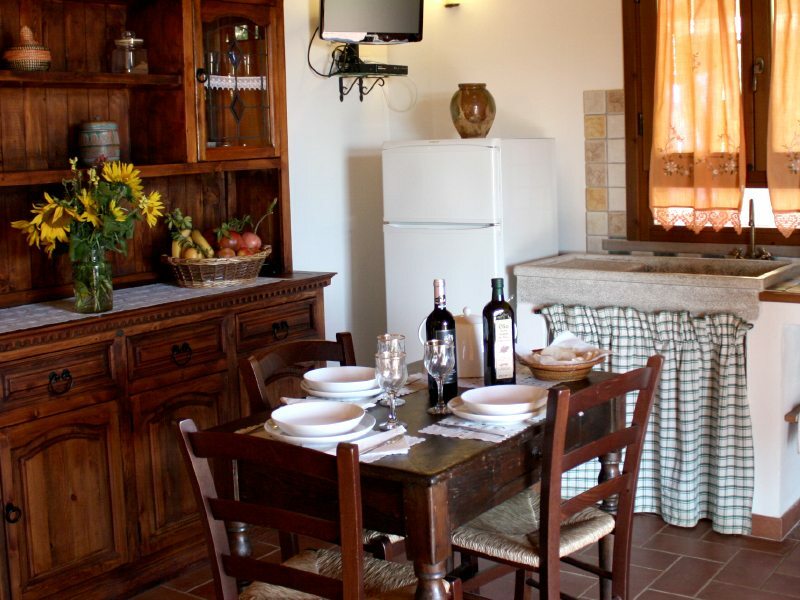 The kitchenette is made of masonry with ceramic tiles hand-made, has a gas hob, an old sink, a two doors refrigerator and television. The hallway leads at the left, to the bathroom with a shower and a window and, on the right, to the bedroom. This is large, has good indoor ventilation, having a window and a door window. 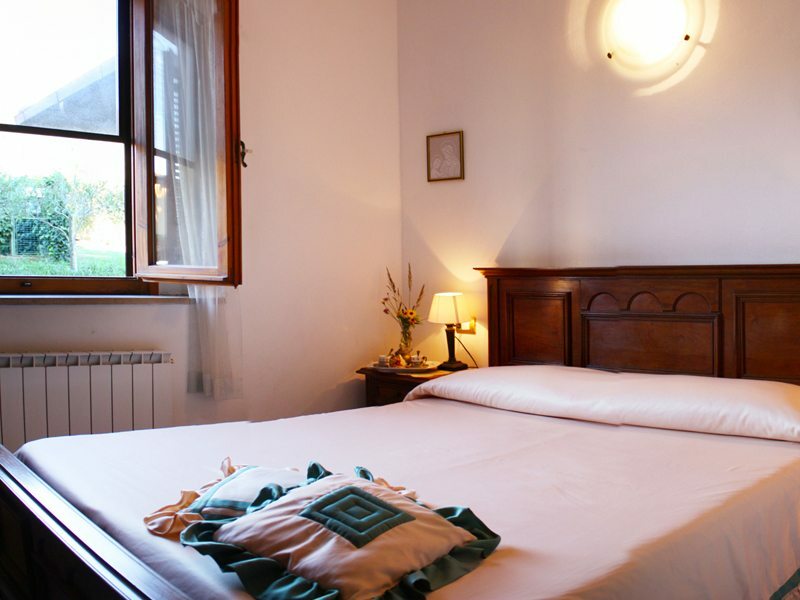 It is furnished with an iron double bed, bedside tables, desk and antique wardrobe. There you can comfortably add a single bed. All windows and doors are equipped with mosquito nets. Equipment inside: dishes, linens, stove, refrigerator 2 doors, TV sat, mosquito nets, wifi. On the ground floor, on the east side of the house, located between the pool and parking, L’Arancia is a nice apartment of 45 sqm with a kitchen, hallway, bathroom and two bedrooms. 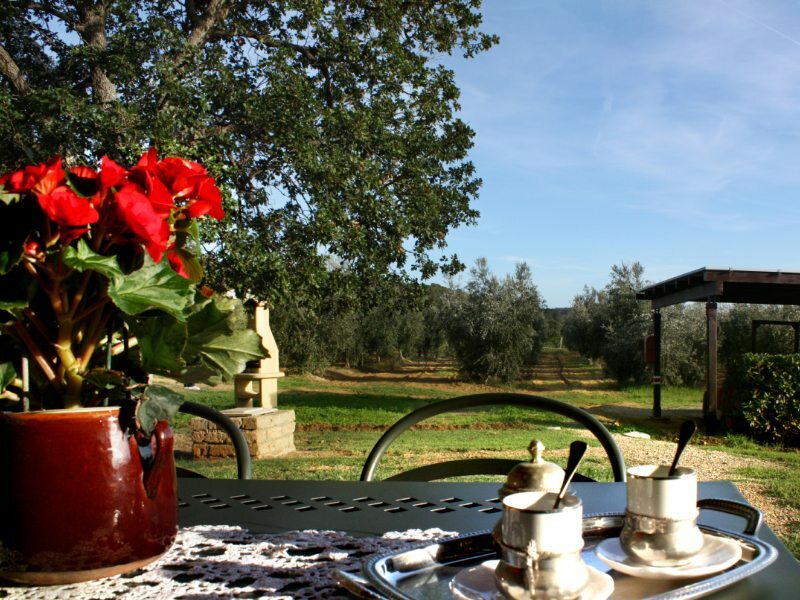 The outside porch with iron furniture, allows to eat quietly nestled among the green olive-trees. 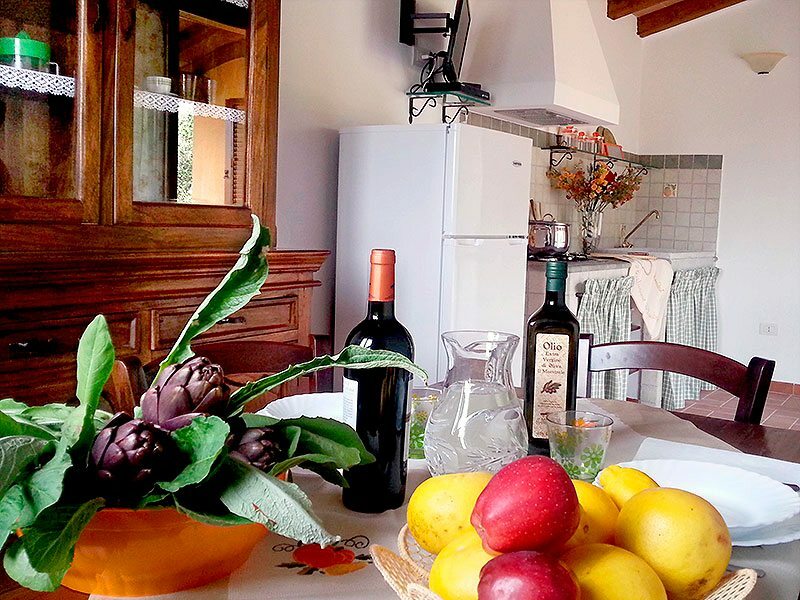 It introduces you into a nice apartment furnished with antique furniture, wooden ceilings and hand-made bricks.appartamento l’arancia the large glass door and the window make the dining room very bright and airy. It is furnished with a table, chairs and an ancient belief double body. 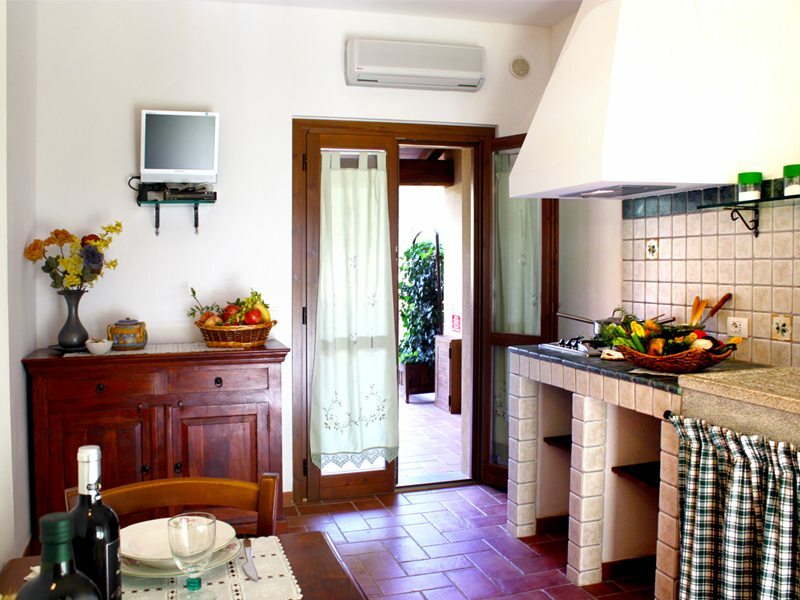 The kitchenette masonry with ceramic tiles made by hand and decorations reproducing oranges, has a gas hob, an old sink, two doors refrigerator and a TV. The hallway introduces, right, to a large bathroom with a shower and a window, and on the left, is a small bedroom, facing this leads to the master bedroom. 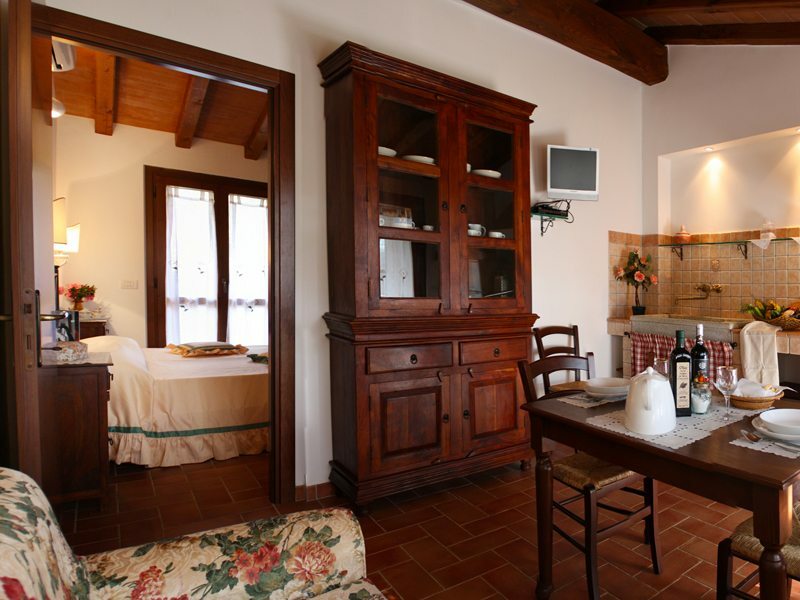 This is furnished with an iron bed, bedside tables and antique wardrobe. It has an excellent internal ventilation becouse it has a window and a door window. 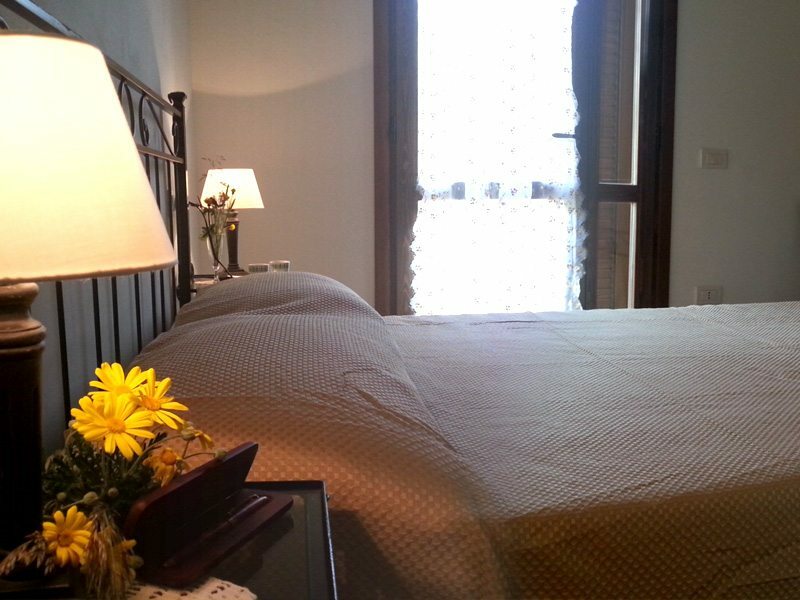 The bedroom, overlooking the garden and pool, is furnished with iron bed in one and half, bedside tables and a wardrobe with 1 door. All windows and doors are equipped with mosquito nets. Equipment inside: dishes, linens, stove, refrigerator 2 doors, TV sat, mosquito nets, Wifi and conditioned air. Located on the ground floor on the south side of the family farmhouse, this apartment has a spacious cool and shady porch. 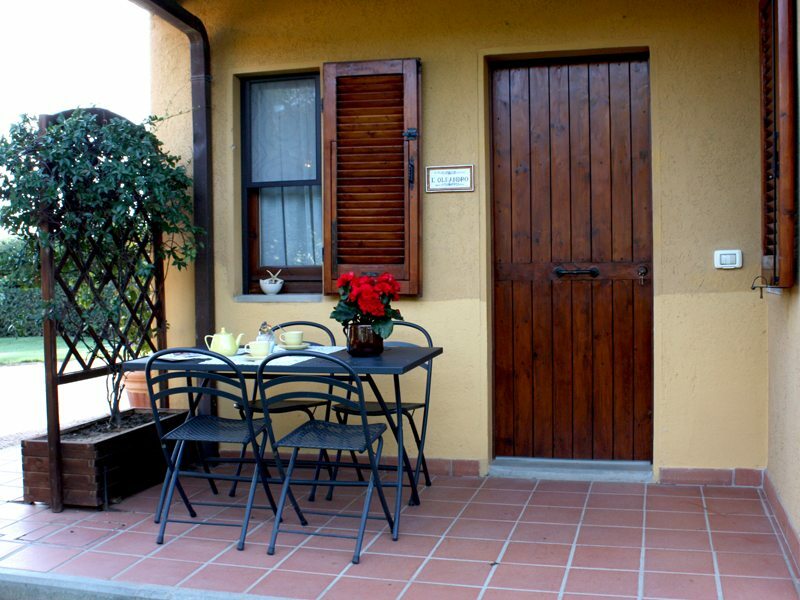 The view on the garden and the comfortable wooden furniture allow pleasant and relaxing moments in the open air. From the porch you can access the hall, finely furnished with console table and stucco mirror. From there, you can access the kitchen/living room or bedroom area. 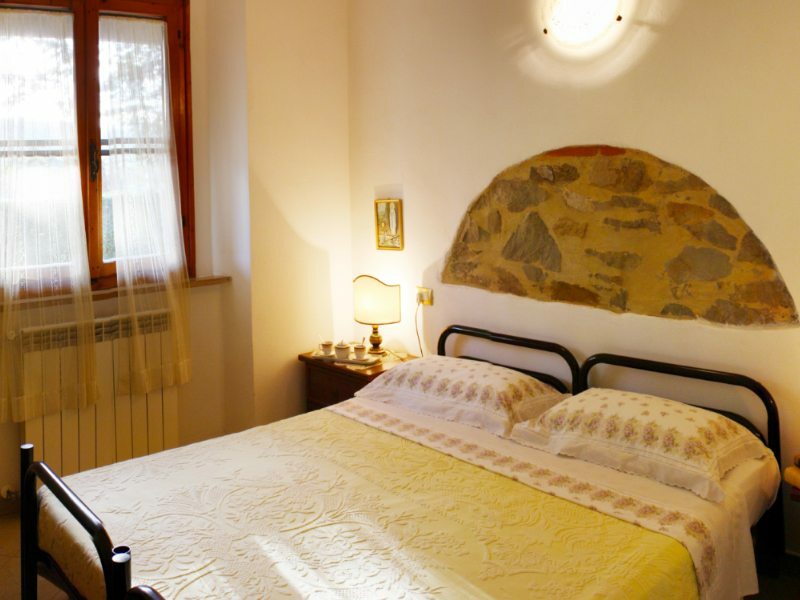 In the bedroom area, separated by an elegant French window, Here, there are two bedrooms: a period double bedroom and an early 20th century art-nouveau bedroom where it is also possible to have 2 single beds. Between the bedrooms there is a spacious bathroom with shower and window. The dining room, with its cool, period and original stone walls includes an elegant dining area with a 3 door base cabinet, round table and chestnut and velvet chairs. The warm golden tones of the furniture match the fabric of the three-place sofa where you can watch TV. 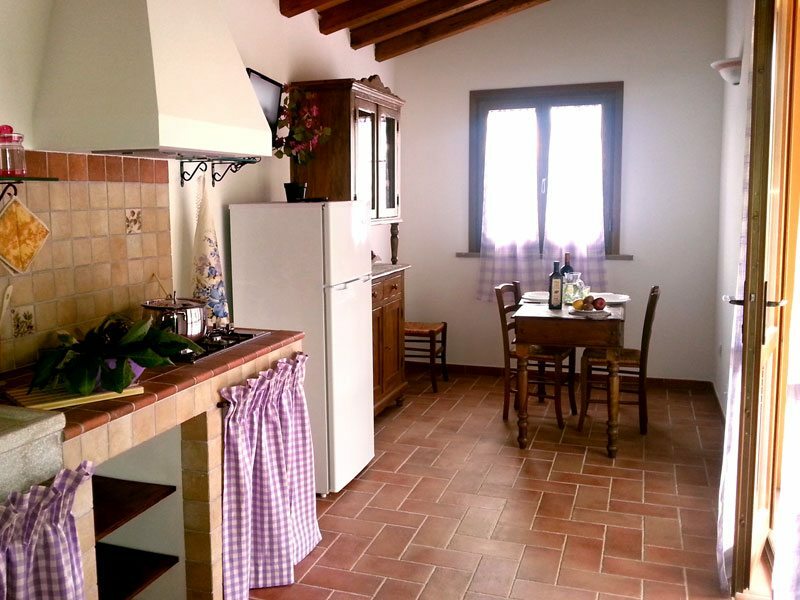 The brick kitchenette has a granite hob, tiles, chestnut furniture, sink, gas hob, fan-assisted oven and 2 door fridge. Internal equipments: cutlery, linen, TV, multi-functional fan-assisted oven, gas hob, big 2 door Ariston fridge with freezer, ceiling fan in the room, mosquito nets on windows and conditioned air.